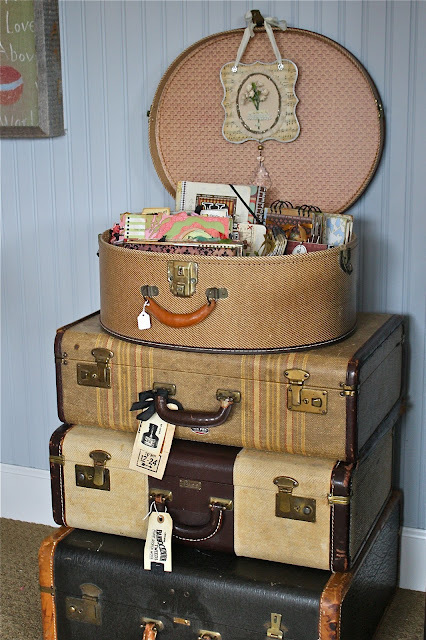 It seems that using vintage luggage is a tradition with us. We have used them in decorating every 7gypsies booth since the beginning. We love the way they look and can be used as a table or riser, opened or closed, they are always a good display piece. The round case holds some of the mini books paula has made over the years. 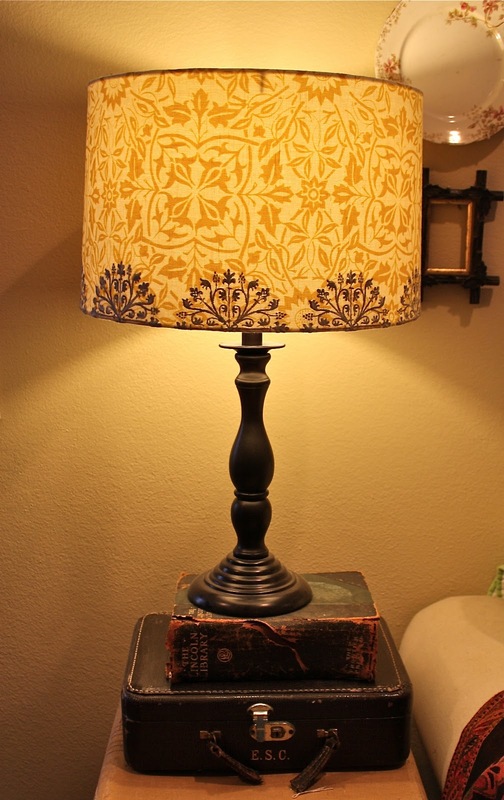 Since that last picture was taken of part of the entertainment unit, the little brown case with the broken handle has moved to the living room where it was needed to raise up a lamp after paula picked up this lamp shade at Anthropologie. My living room, that's a lot of suitcases! Paula is going to Art and Soul next week in Las Vegas. 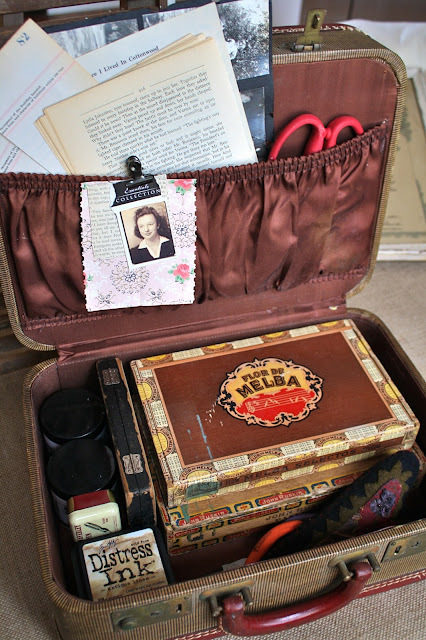 She packed a vintage train case with her supplies she will need for classes. This train case has a second compartment below. 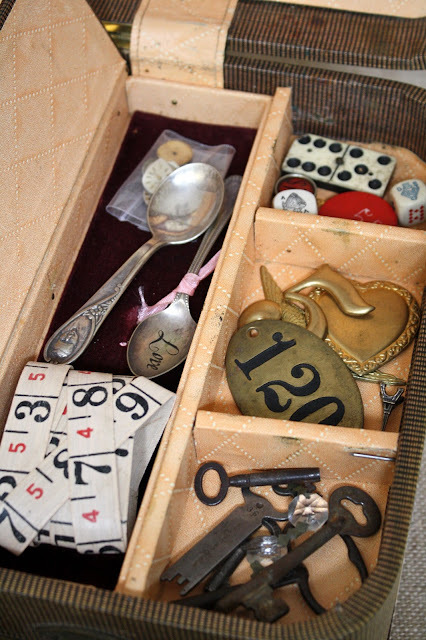 Perfect for vintage cigar boxes that hold ephemera and tools. There was even a couple at my son's wedding last year. We were asked a couple of questions about suitcases. Even though we have a lot of vintage luggage we don't really see ourselves as experts....but we will give it our best shot anyway. We don't mind if they have a little bit of a musty smell....just part of the appeal. Although if it was really bad you might try Fabreeze or something similar. Spray it on and let air out in the sunshine for a day or so. Update: We got an email this morning from Tammy L. about getting rid of the musty vintage suitcase smell. 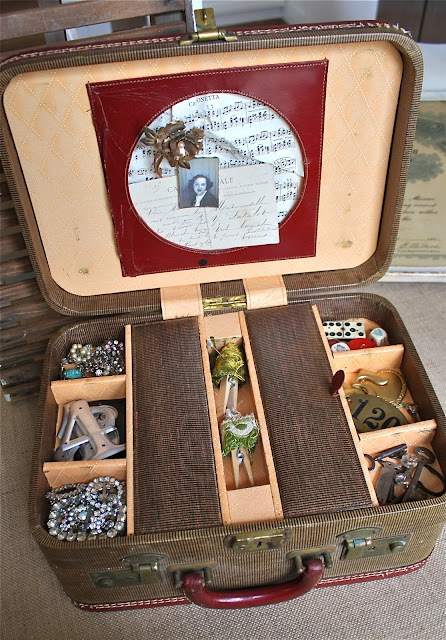 "I love the old suitcases and trunks as well, but sometimes they leave a lot to be desired as far as odor. Here is what has always without fail worked for me. First take newspaper and squish up into balls enough to fill the suitcase then take a paper plate and squirt toothpaste in the center. Set the plate on top of the newspaper and shut the suitcase up. leave closed for a couple days and tada minty fresh suitcase. A couple of times I've had to do this twice but usually once does the trick. Just thought I would share what has kept me from passing up even some of the smelliest yet beautiful suitcases out there." Thanks Tammy! I am going to try this! 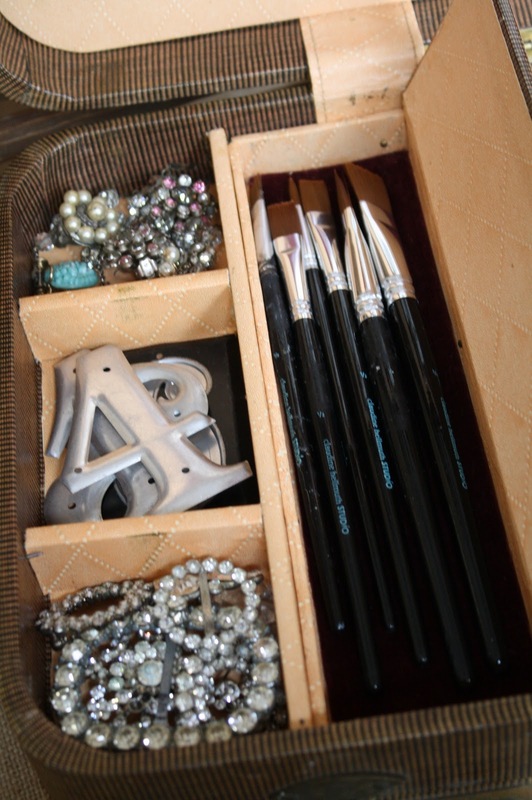 What paint do you use to paint a suitcase? 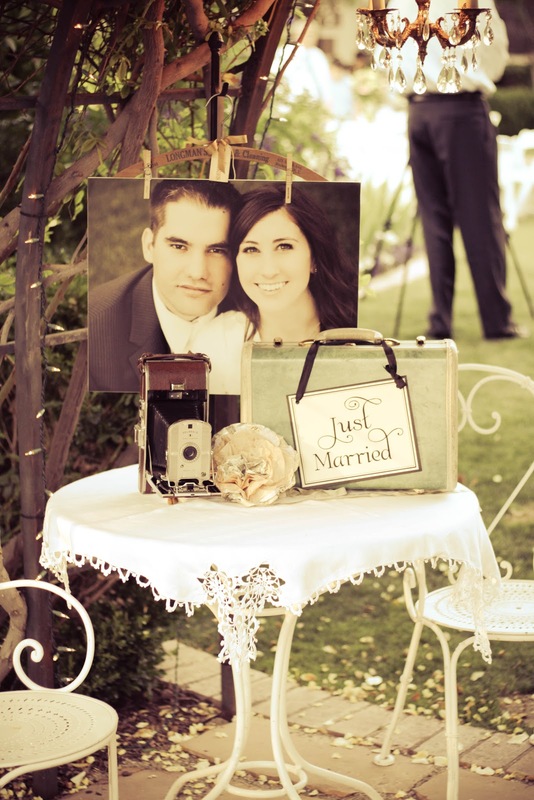 One of the pictures of painted luggage came from "A Beach Cottage". We found in a different blog post some information on how they painted theirs. You can find it here. Looks pretty simple! Thanks so much for all these great photos!!! 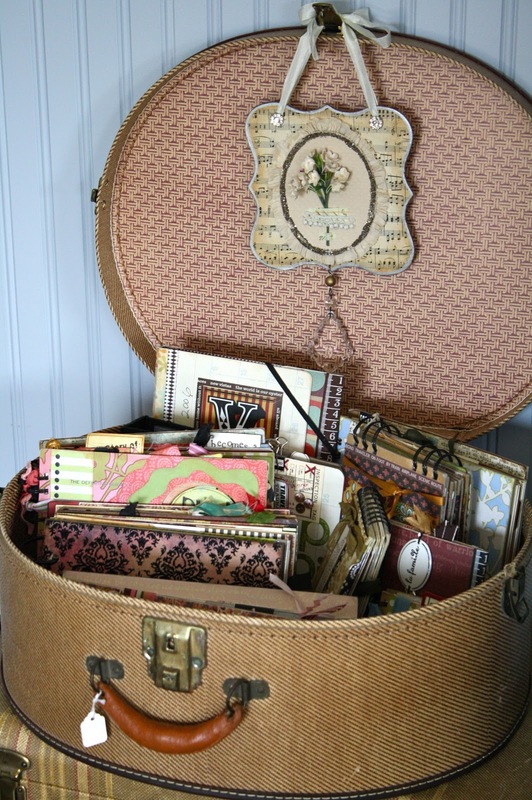 I love the idea of using vintage luggage in home decorating. Such a unique and fab look!! Oh,the stories these could tell...Thank you for sharing...I love old luggage too..and hunting for it is half of the fun! Thank you for your fabulous post!! I would love to know where you purchased your cloche. I love the size of it. Take care!! Thanks for the peek into your personal living spaces. Love those little vintage train cases filled with all sorts of goodies. I so appreciate the suggestion about the smell, thanks! I've not used some of mine as the musty odor was enough to knock you over! Thanks for sharing the photos of your homes! I love how you both used the vintage suitcases as well as all of the other little nooks and cubbies full of vintage goodness! A feast for the eyes! Good day! I loved the bags to organize materials. Thanks for the ideas. Thanks so much for the idea on how to get rid of the smell as I have tried febreeze numerous times and can still smell the yucky smell, so I will surely try the news paper and tooth paste. Thanks for sharing and love your art. Bellísimo album.. pura creatividad compartida con talento y buen gusto.. Gracias !